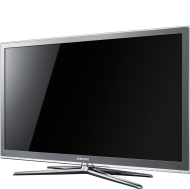 alaTest has collected and analyzed 47 reviews of Samsung UE46C8000 Series. The average rating for this product is 4.6/5, compared to an average rating of 4.3/5 for other products in the same category for all reviews. We analyzed user and expert ratings, product age and more factors. Compared to other products in the same category the Samsung UE46C8000 Series is awarded an overall alaScore™ of 89/100 = Very good quality. alaTest has collected and analyzed 16 user reviews of Samsung UE46C8000 Series from Amazon.co.uk. The average user rating for this product is 4.8/5, compared to an average user rating of 4.3/5 for other products in the same category on Amazon.co.uk. It's a gorgeous-looking telly, but can its picture prove it's more than just a pretty set? Although it’s expensive and 3D has a few teething troubles, the UE46C8000 is something special. 3D is just one of many reasons to recommend it - the amount of other features is staggering and if you can find a better looking TV we’ll eat our 3D glasses. The C8000 offers a genuinely innovative 3D experience which addresses some of the glitches found on the C7000 ..
AVForums reviews its first 3D TV with the Samsung C8000 but is it a game changer?